Have you seen or heard of the movie "Boyhood"? nominees for "Best Picture" at the Academy Awards. a point that I'm ready to show it to you. I didn't take a picture each year of the laundry room. gold/mustard/ochre with paint leftover from one of the bedrooms. The back door opens directly into the laundry room. company coming in the back door got to experience that. photo looks like I took it with a fish-eye lens or that the house belongs in he movie "Lemony Snickets". Ventura/Pet Detective"..."Do NOT go in there!" the end of "The Wizard of Oz". the holiday and now it is 99% done...it may never be 100%. I have named it the "Coffee and Wine Bar Launderette". a foyer-type area, it is only 3' x 4.5'. The above picture is if you were looking up in the "foyer". the attic so they take up the space above the doors here. of the side of the extra refrigerator that is also in this area). washer, dryer and extra refrigerator taking up that wall. are having company for meals. I like to clean up after company has gone, not while they are here. syllables than "the refrigerator in the laundry room". Bob holds cake stands, cloches and stuff like that on his top. The peel and stick image on the side of Bob came from Dollar Tree. side of the room is on the right. This counter area was already here when we moved in. yellow as a color combo became popular so I just kept it. coffee end of the bar. whole pot of coffee each morning. As part of the "years in the making" process, I got this clock at Target 2 or 3 years ago. I don't think they carry it any more. between the coffee end of the bar and the wine end. of wine is an experience with this thing. planning on changing out on the chalkboard. hold our nice crystal stemware. out the plastic sink too but that is way down the priority list. with plastic bags and hung on a hook (kinda like 3-D art). only $5 on a 50% off sale..
chalkboard-looking sign...only $12.50 on sale. theme but with the other chalkboard in the wine bar area. "Do NOT go in there"...yet...maybe it will be pretty one day too. So that is the tour of the "finished for now" laundry room. Want to see some "behind the scenes" of how it was done? That movie theme tie-in to this blog just seemed to happen out of nowhere. camouflaging the shelves and their contents under the counter. areas to hold the curtains. Unfortunately, you can't always use tension rods...you have to have a structure that you can put the rods between. screw or hammer anything to make them stay up. the screw on the back of the rod. going to put the rod in between. point. Slide the screw up behind the spring. Tighten the screw down to hold the spring in place. via the spring and fit inside of the space. Release. allowed more freedom of creativity than my sewing machine. 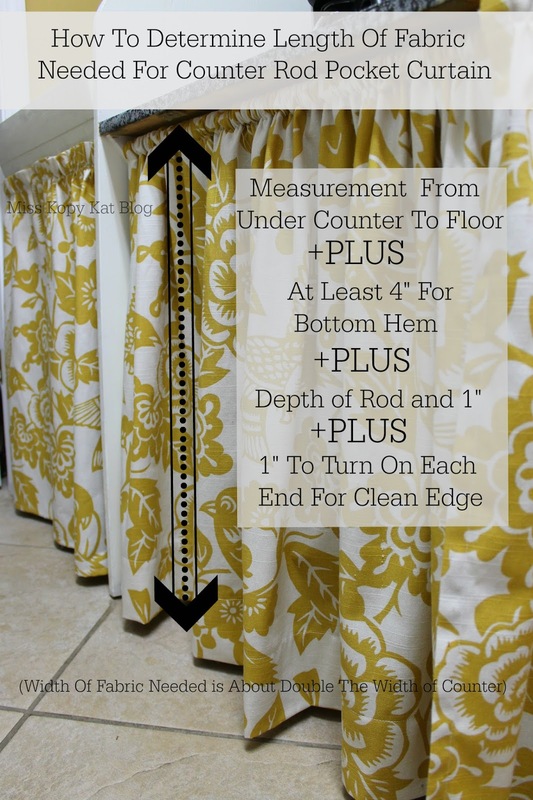 These rod pocket curtains are really easy to make. from trying this easy sewing project. sewn panels as examples...hope this helps. Measure the basic height between the counter and the floor. curtain rod plus an inch. Add another inch for clean edges. fabric together sideways to make it wide enough. would not fray over time. the "wrong" side of the fabric, iron then sew it down. 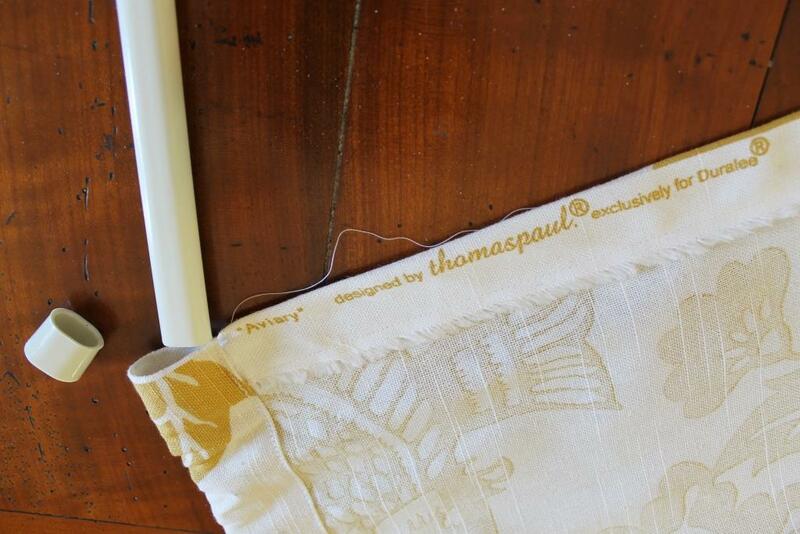 The bird fabric that I used is the Maize colorway of "Aviary" designed by Thomas Paul for Duralee Fabrics. A few years ago I bought it at a local fabric store for about $15/yard but it seems to cost more now . 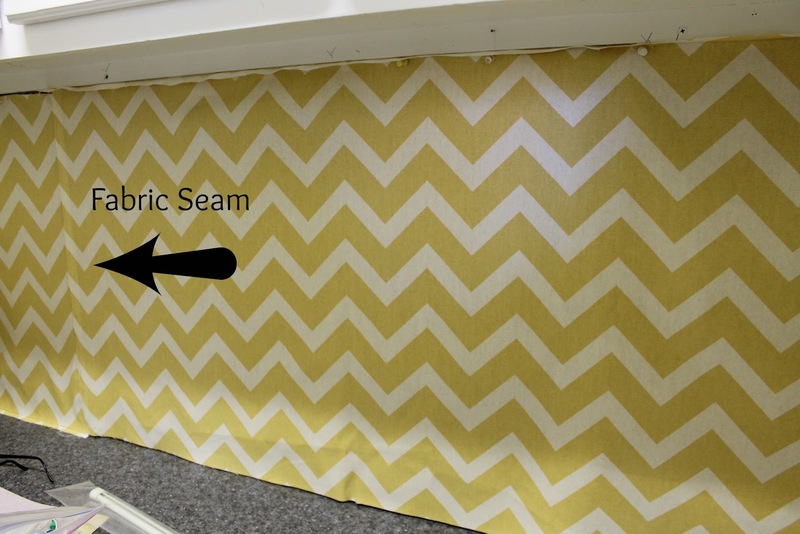 top edge of your fabric panel and iron it flat. curtain rod plus about another 1/2" . once the fabric is scrunched up on the rod...as long as your rod can fit in the pocket, don't worry about it. sure that it fits with a little extra room to spare for scrunching). rubber end cap off and then replace it after inserting the rod. out quite right if I try to make them perfect from the start. for a person. I turn the hem up and pin where it hits the floor. 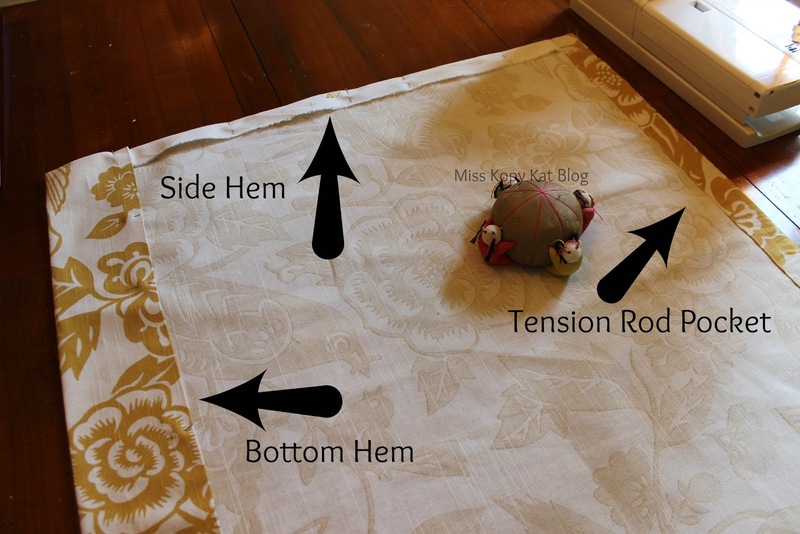 the bottom hem, pin it, then sew it with a straight stitch. some of the fabric over the rubber ends of the tension rod. a tension rod to attach the curtains, I used velcro strips. want the curtains to stick to. fabric but I tried it anyway...they were right. but they were gathered on top to give a similar look to the scrunched panels on the rods. surfaces but had "let loose" on the fabric curtains side. sticking on the utility sink and the curved part of the counter. So far that fix is working well. along the sink that I was running out of the bird fabric. very similar colorway to the bird fabric to cover the cork board. The cork board was already in the area when we moved in. I think they just glued cork squares onto the wall. was going to take too long....that's when I decided on fabric. join two pieces of the fabric together to span the length. join the pieces together from the "good" side and just top stitch them together. so that when it was sprayed with adhesive, it would fit neatly. and then cut it to a very close size. in the driveway with a spray adhesive. any lumps, bumps, wrinkles while the adhesive is still wet. edge the corkboard with to cover the edges and hide my boo-boos. settled on this gray polka dot grosgrain ribbon...gotta move on. angles at the corners...I didn't try to turn the corners with it. version of the tension rods used to hang the counter curtains. out even more light into "foyer" area if it were lined. lined with a white fabric...a project for another time. yellow ochre paint to tie it in with the color scheme. that the yellows were not a very close match after all. Another paint project in the "Coffee and Wine Bar Lauderette"
craft paints were sponged painted on top of the edge. live and learn...good enough for now. something with more personality and softer light. "warm white" bulbs but the only choices at the home improvement store were "cool white" and "daylight"
that would fit this fixture. I decided to try the "daylight"...I didn't know that it is very white...just FYI. laundry room will be 12 years in the making like "Boyhood". I don't usually comment, but I have to tell you what a great job you've done. I like the color you've used and I think the curtains in both places look good. I bet your coffee/wine bar is a big hit with friends. I love it all. What a great space and you've made it so pretty too. You have the best ideas! The colors in your laundry room are perfect and I like the print of the ribbon edging much better than what you originally wanted. Great job! What a unique laundry room, I love it! I love all the quirkiness of it and the way you've redone it! I just recently redid my laundry room too. 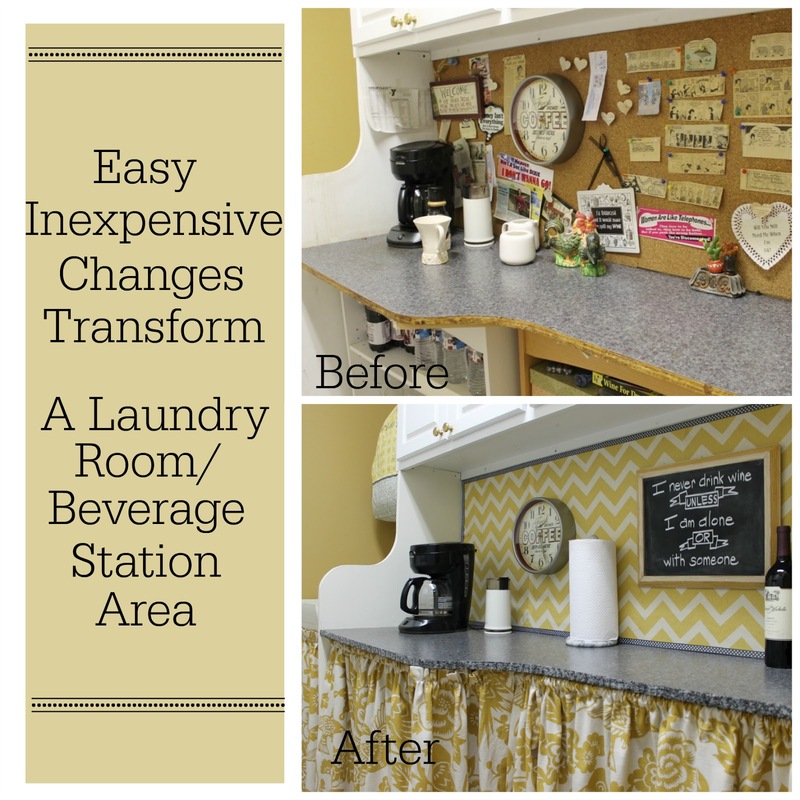 Gayle, Your laundry room is so cute and I love the fabrics! 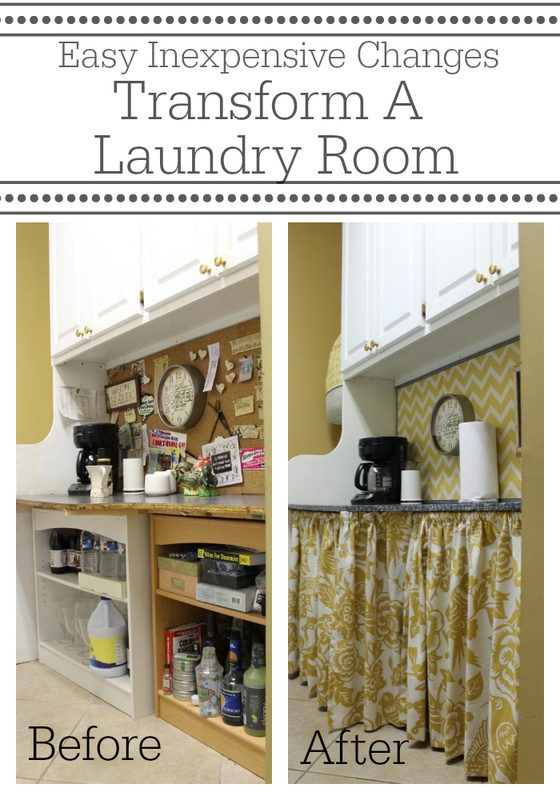 I want to dress up our laundry room but it is on the bottom of a long list of things I want to change in our home. You did a wonderful job! So many cute ideas, love that stuffed laundry bag and chevron always makes things cheery! As does a wine bar! Wow I love your laundry room makeover and your colors are great. LOVE chevron. Need to redo mine now. Thanks for sharing and inspiring me. mind doing laundry out there at all. sink. Sure enjoyed my visit. Hi Kitty, I am getting some great ideas here to use in my laundry room. Love the coffee/wine bar, I need a space like this. I love your pretty yellow and fabric, love the end results. I've been know to lock my laundry when we have guests! Great coffee and wine bar! I love the chevron, you did a wonderful job my friend. Wow! You've done an amazing job! Love the fabric and the laundry sign is perfect...what a great find! Adorable Laundry Room! I love the fabric you used. Thank you for sharing over at the Snickerdoodle Sunday.